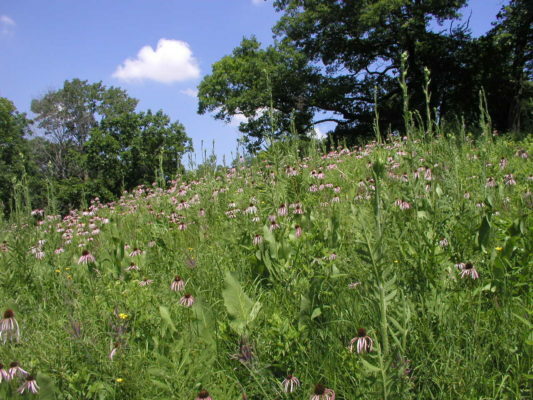 Hopewell Hill Prairie Nature Preserve and Fern Ridge Nature Preserve consist of eleven undeveloped lots, totaling 13.26 acres, within the Hopewell Hills Illinois Natural Inventory Site. They have been acquired over the years by Maury Brucker and Emiko Yang and have been actively managed to protect the natural features. Hopewell Hill Prairie Nature Preserve includes several hill prairie remnants while Fern Ridge Nature Preserve is more wooded with healthy populations of ferns and yellow lady-slippers orchids. Maury and Emiko donated the property to Illinois Audubon Society in February 2019. A management agreement will be developed with Peoria Audubon Society who will serve as the Hopewell/Fern local sanctuary committee.